Half-Way Motors Mazda | Get the 2019 Mazda CX-3 Today! 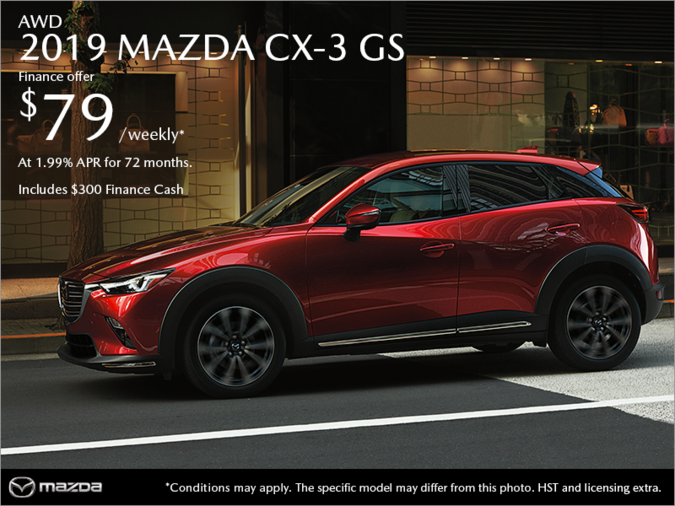 Finance the 2019 Mazda CX-3 GS from only $79 weekly at 1.99% APR for 72 months with $3,815 down! ‡‡Finance Pricing for new 2018 Mazda6 GS 6AT (G4SN88AA01)/2019 CX-3 GS AWD (HXSK89AA01)/2019 MX-5 GS (L2SK69AA00)/2019 MX-5 RF GS-P (L3PK69AA00) is $29,281/$27,176/$34,943/$41,943 financed at 0%/1.99%/2.99%/2.99% over 72/72/84/84 months equals weekly payments of $89/$79/$99/$119 with $1,375/$3,815/$2,435/$2,865 down payment, cost of borrowing is $0/$1,427/$3,530/$4,243 with a total obligation of $29,281/$28,603/$38,472/$46,186. As shown, 2018 Mazda6 GT (G4TM88AA01)/2019 CX-3 GT (HXTK89AA01)/2019 MX-5 GT (L2TK69AA00)/2019 MX-5 RF GT (L3TK69AA00) $38,081/$32,876/$41,943/$44,943 financed at 0%/1.99%/2.99%/2.99% over 72/72/84/84 months equals weekly payments of $118/$99/$120/$128 with $1,375/$3,815/$2,435/$2,865 down payment, cost of borrowing is $0/$1,775/$4,290/$4,569 with a total obligation of $38,081/$34,651/$46,233/$49,512. NOTE: 2019 CX-3 finance offers include $300 finance cash. Finance payments include freight and P.D.E. of $1,795/$1,895/$1,795/$1,795, $10 OMVIC fee (all models), $20.00 ($16.00 for MX-5/MX-5 RF models) Tire Stewardship fee (all models – covering the cost to Mazda Canada of collecting and recycling tires), $100 Air Conditioning charge (where applicable) and PPSA of $106.39/$106.39/$121.61/$121.61. First weekly payment is due at finance inception. Offers exclude HST.